This year’s event will feature The Interfaith Amigos. Rabbi Ted Falcon is known as a spiritual guide, author, therapist and teacher of Jewish meditation. Imam Jamal Rahman is a popular speaker on Islam, Sufi spirituality, and interfaith relations. Together they have spoken widely, exploring the frontiers of interfaith spirituality. At this event they will be joined by Christian minister from the Lincoln-Omaha area. The dinner will include a brief talk by the Interfaith Amigos. The cost is $15 per person; advance tickets are required. Because a similar event last year sold out in less than a week, organizers have added a free lecture at 7:30 p.m. following the dinner. The lecture is open to the public, however registration is required to ensure adequate seating. To purchase tickets for the dinner or register for the lecture, visit www.niagarafoundation.org/nebraska. This gathering of the Abrahamic faiths is sponsored by Saint Paul Church, Westminster Church, Union College, the Niagara Foundation, ARYA, Interchurch Ministries of Nebraska and south street Temple. April 3, 2012 - ARYA will help host Niagara Intercultural Reception at the State Capital Building at 12pm, at 1445 K St, Lincoln, Ne 68508. 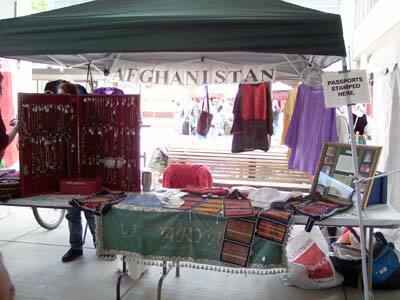 ARYA will have a booth display for Afghanistan with works of Afghan women and children. April 30, 2012 - Sacred Sites of the world is title of OLLI classes. Farida Ebrahim will present the fifth pilar "Hajj". The class will be held from 10:30 am -12 noon. March 29, 2012 - ARYA and Niagara Foundation of Nebraska are hosting Dinner of Abrahamic Traditions at West Minister Presbyterian Church at 2110 Sheridan Blvd.Lincoln, NE 68502. Learn more via this Lincoln JournalStar article. March 16, 2012 - Nawroz Celebration in City Union at 6pm. ARYA and other student groups who celebrate the Solar New Year on March 21 will come together to have one celebration for all nations who's year starts on March 21st or celebrate this day as a holiday. October 18, 2011 - Farida Ebrahim will be speaking to PEO Chapter FG of Lincoln about ARYA, 12:30 to 1:30 pm at 8240 Karl Ridge Rd. Lincoln, NE 68506. "P.E.O. Chapter FG is one of 27 chapters in Lincoln, Nebraska. P.E.O. is a philanthropic educational organization that promotes educational opportunities for women." March 28, 2011 "Afghanistan" Farida Ebrahim will preset on Afghanistan History, Culture and Religion. The program will be held at 1827 B street 7pm. March 18, 2011 "Women in Religion", Farida Ebrahim will represent women in Islam. The program is held at 11:30 Nebraska Union. March 6th, 2011 " Engaging Islam" A series at Westminster Presbyterian Church. Farida Ebrahim will be the speaker on March 6th. "ENGAGING ISLAM—In February, we’ll seriously consider PCUSA’s recently adopted document, “Toward an Understanding of Christian-Muslim Relations” through engagement with the Muslim faith tradition and calls for greater interfaith exchange. In the early part of the month (Feb 6 and 20), Rev. Bob Snell will lead us through a brief educational introduction. Rev. Dirk Ficca, Executive Director of the Parliament of World Religions will join us on Feb 13 to talk further about interfaith exchange and Christian-Mulsim relations. Toward the end of this series, we’ll be joined by noted Qu’ran scholar Dr. Simon Wood of UNL’s Department of Classics and Religious Studies (Feb 27) and Farida Ebrahim of Lincoln (March 6) to learn more about this religion and the experiences of practicing Muslims in Lincoln." ARYA will be selling semi-precious stone jewelry, embroidered shirts and bags, at Jazz in June. 100% of profits will help the orphans and widows in Afghanistan. Celebrate Lincoln - June 19 and 20, 2009 from 11am to 11pm. ARYA will be part of the World Market. ARYA will sell semi-precious stone jewelry, embroidered shirts and bags, 100% of profits will help the orphans and widows in Afghanistan. Location 14th and N streets, Lincoln, NE. May 12, 2009 - Welcome Wagon Group; Farida Ebrahim will present "Life in Afghanistan". ARYA will sell semi-precious stone jewelry, embroidered shirts and bags, 100% of profits will help the orphans and widows in Afghanistan. Location: 95th and O streets, Lincoln, NE. April 21, 2009 - The OLLI Life Long Learning program invited Farida Ebrahim to lecture on Islam: Similarities and Differences With Christianity. ARYA was able to sell goods at this event. Location: Unitarian Church, 61st and A. Lincoln, NE. April 11, 2009 - The Nebraska Institute of Technology Tea and Talk group invited Farida Ebrahim to lecture on Life as a widow in Afghanistan and in particular the crisis with the ARYA supported orphans. Location: The Nebraska Institute of Technology, 1145 N. Cotner, Lincoln, NE. Feb 10, 2009 - Farida Ebrahim presented a lecture on Islamic faith and culture to students in the Nursing Program of Bryan LGH Hospital, Lincoln, NE.